In 1967 an upstart basketball league was formed, aimed at taking on the powerful and incumbent NBA. That league was the legendary ABA, the American Basketball Association. The most successful independent alternative professional sports league in history. This is the league that gave us such Hall of Fame talents as Dr. J, David Thompson, the Iceman George Gervin and more. They did so by providing an opportunity for struggling African-American kids to earn a living, (one of them right out of high school), and help support their families. An opportunity denied by the powers at be in the NBA for arbitrary reasons. MLB and the NHL allows high schoolers to go right from high school and start their careers, a right given to anyone in this country but denied African American basketball players (unless they chose to go overseas). The ABA gave them the same rights given to those in more privileged situations. And because of it, they quickly became equal (some say superior) to the NBA in talent level. It also led to competition for players’ compensation due to the shattering of the NBA monopoly, and the NBA has resented this ever since. Unfortunately for the ABA, this was before the proliferation of cable and their sports channels so the TV deals were limited, which made them struggle financially. This led to their desires to seek a merger. During the years of existence, the NBA had to hear from the fans about players like Dr. J being in the “other” league and this caused much angst among the league. How can they claim to be the best league in the world, when some of the best players are in the ABA? This, combined with a desire to end the salary wars, incentivized them to agree to a merger with the hated ABA. The merger was completed in 1976. Four ABA teams were added to the NBA, one (the very successful Kentucky Colonels) were bought out and one other team, the Spirits of St Louis, agreed to not fight the merger, in exchange for 1/7 the media rights from each of the 4 ex-ABA teams……in perpetuity. This is known as the greatest sports deal in history. But more on that later. As much as the NBA hoped otherwise, the ABA proved to be their equal post-merger. 4 of the top 10 scorers we from the ABA. The leader in steals was Don Buse, another ABA player. Ex-ABA teams like the Nuggets finished with the 2nd best record in the NBA and the Spurs won their divisional title. All in all, ex-ABA team have won 5 NBA championships and been to the finals 4 times. More important than the success of the teams and the players, what the ABA has brought to the NBA has been the foundation of the style of play that has enabled the NBA to grow from a league that couldn’t even play their finals on prime time, to the billion-dollar success of today. Innovations such as the 3-point shot, slam dunk competitions, and the wide-open, in the air style of play, all had their genesis in the ABA. At the time of the merger, the players were promised to be treated as equals to the NBA players, in all areas such as collective bargaining and pensions, yet the NBA has done little, and have taken advantage of the ABA players lack of knowledge of corporate affairs, and their inability to fight the NBA in court due to finances. Meanwhile the list of ABA players who have died destitute grows and grows, leaving the NBA to “wait it out” and let the problem solve itself. This comes on the heels of a new multi-BILLION dollar tv contract! So, are they saying they can’t afford to help? They paid off the previously mentioned Silnas (the owners of the Spirits of St Louis) 500 million dollars NOT to get out of the onerous in-perpetuity deal, which still exists to this day and has earned them more than 300 million, but to settle the other moneys owed them from cable internet etc. And they can’t help these players? The sad thing is the players are not even asking to be treated like their NBA peers, which they were promised. And is their right. They just want simple cost of living increases so their lousy $60-$75 per month per year of eligibility can be increased to $300 (details are in the petition). In other words, if each NBA team put in 1 million dollars (one time) the interest alone could fund their pensions, and allow some of these to put food on their table. These are not greedy players asking for millions, they are players asking to survive. So, is this simply a case of greed? Perhaps, yet I believe otherwise. The excuses they could make and my responses. You had no obligation to help the pre-1965 players but did it because it was the right thing to do, supposedly. Take advantage of legal loopholes is despicable and maneuverings against these financially strapped players is horrific. As you know, the ABA was MERGED into the NBA and were supposed to be treated just like NBA players. The amounts are pitiful, maybe a thousand here or there. Again, the sad thing is, the players are not even asking for much. They are not asking for the same amounts as the NBA players of the same era, which they deserve by the way in my opinion. A lousy cost of living increase to 300 bucks per month per year of service. It could mean the world of difference for many of these players, actual food on the table. And here is the worst thing. Again, the NBA just got a new tv contract worth BILLIONS!!! All the while making money licensing the players’ names on retro shirts (without permission), and selling the legendary ABA ball. One million per team (one time contribution) could fund the entire pension issue for the remaining 149 players, on interest alone. There is one final affront to these players who made the NBA the success it is today. They’ve not only starved them, and taken money out of their pockets, leaving many to die homeless, they’ve also taken their legacies and tarnished the memories. They’ve allowed the ABA trademarks and name to be diminished, by allowing a 4th rate (in my opinion) minor league to use it and claim to be the original ABA, of which no ABA players want anything to do with it, and allowed the fans to think that the real ABA was just like this one. The more time passes, the more younger fans will think THIS is the ABA. So how can the NBA make this right in my opinion? Two simple steps. 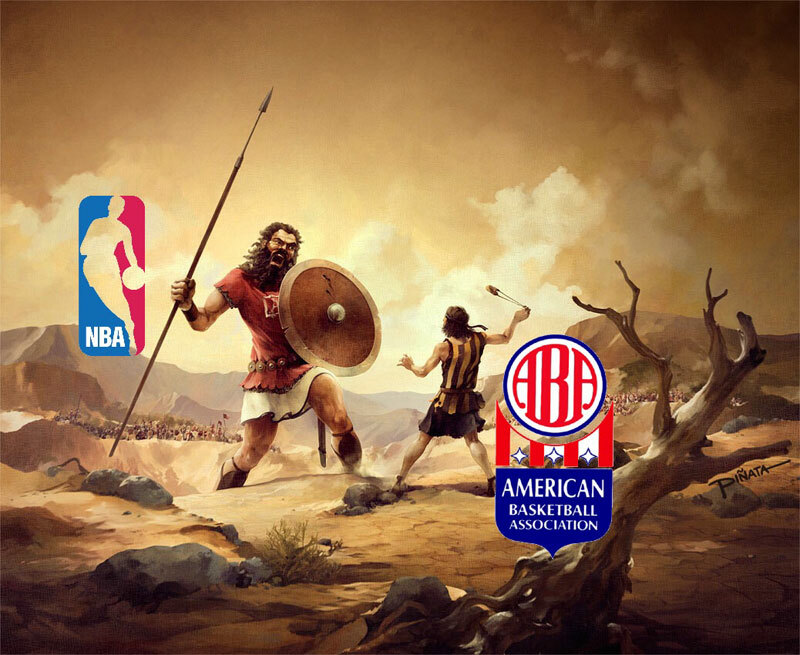 First, Adam Silver and the NBA should find the ABA pension as promised. While it is too much to expect them to give them the same pension as the NBA players of that era (though it is the right thing to do), just give them the lousy $300 per month per year of eligibility they are asking for. Again, take 1 million per team and put it in an annuity of some sort and it will earn them enough on the interest to pay the pension. And it may even be a charitable deduction for the teams. Second, give the ABA trademarks (except for the existing 4 teams in the NBA) to the players. They made the marks what it was, they deserve to profit from them. Adam Silver, I am begging you, do the right thing.